1. Achieved a nice feeling and stable electrical specification. 2. Achieve low profile equipment by using SBH series. 3. 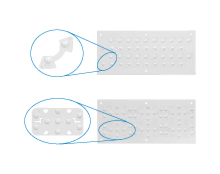 Provide product lineup that has a variety of switch sheet types to help make the set thinner. These type of switches have the metal dome mounted on the cover tape. 1. For small, portable AV equipment operating switches. 2. For mobile phones, smartphones, PDAs, input key switches.